Chattogram City Corporation (CCC) has taken initiative to repair the dilapidated ‘Arakan Road’, one of the main roads for reaching the city from the South and North Chattogram, to reduce sufferings of the commuters. Sources said Chattogram Water Supply and Sewerage Authority (Cwasa) started digging the road for setting up underground supply pipeline under a project titled ‘Project to upgrade water supply and sanitation in Chattogram’ blocking one side of the road at the begging of 2016. The works were hampered severely due to heavy waterlogging and construction work of ramp of a flyover in the Bahoddarhat area in 2017. The Cwasa, however, handed over responsibility of the road to the CCC authority after completion of their works last year. On the other hand, though Karnaphuli Gas Distribution Company Limited (KGDCL) began digging the road for setting up their transmission line at the middle of the last year, they are yet to complete the works entirely. Sources said commuters, residents and businesses have been suffering immensely as one side of the busy road remained blocked for around three years due to the development works. The transport workers and owners have also been experiencing the suffering due to dilapidated condition of the rest part of the road. Hundreds of vehicles are seen remain stuck due to additional pressure and narrow space at different points of the road causing sufferings to the commuters. Commuters face huge tailback at some points including Bahoddarhat Bus Terminal to Sarafat Ullah Fueling Station in Puratan Chandgaon police station area, Moulavi Pukur Parr, Kalurghat C&B, Bahir Signal, Kaptai Raster Matha and in front of Chandgaon Residential Area. The commuters especially office goers, garment workers and students of educational institutions bear the burn of the situation much in the peak hours. Alongside sufferings of the commuters, business activities in the areas are also being hampered to a larger extent. The businesspeople alleged that turnover of their business reduced to around half due to the road as customers are reluctant to visit their shops facing the hassles. Besides, the commuters and pedestrians also suffer from excessive dust in the area. With the aim to repair the road for an end to public sufferings, the Executive Committee of the National Economic Council (ECNEC) headed by Prime Minister Sheikh Hasina approved a development project involving Tk 71 crore at the end of the last year. 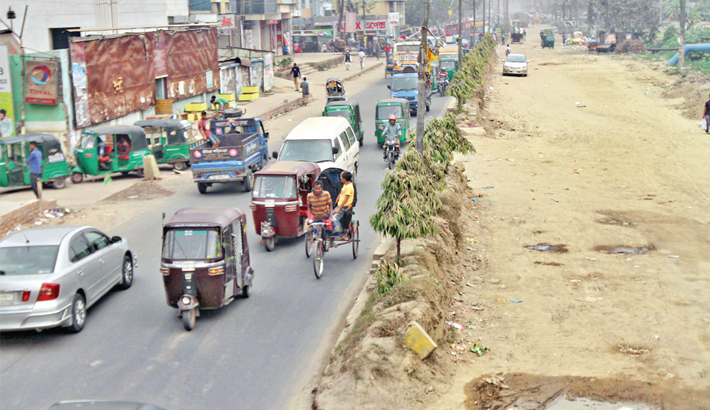 Besides, the Cwasa has already handed over a cheque of Tk 5 crore to the CCC authority for repairing the busy road, said Cwasa Superintendent Engineer (Planning and Construction) Mohammed Ariful Islam. Contacted, CCC Executive Engineer (Civil) Jashim Uddin told the daily sun that they took the initiative to carry out repair works of the road to reduce sufferings of the road users. “The main repair works of the road will be stared by March this year after completion of necessary procedures including tender,” he said. Replying to a question, he said they could not start repairing work of the road in due time as the concerned agencies took much time compared to the scheduled one to complete their works. Executive Engineer Jashim hoped that the sufferings of the road users will be removed after carrying out the repair works. Regarding the road, concerned CCC Ward Councillor Md Saifuddin Khaled said works for beautification of footpaths on the both sides of the road will be carried out along with the repair works. He said the repair works will be done properly so that the road users get benefits from it for long.